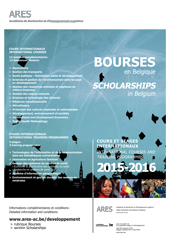 Within the framework of the Belgian policy for development cooperation, the Minister for Development Cooperation and the Directorate-General for Development Cooperation entrust the Belgian Higher Education Institutions with the preparation of Postgraduate Programmes (Advanced Masters) and Training Programmes that are specifically oriented towards young professionals from developing countries. International Courses and Training Programmes are part of the global study programmes of the Higher Education Institutions. They are open to all students who satisfy the conditions of qualification, but aim at proposing training units that distinguish themselves by their openness towards specific development issues. Within the programme for International Courses and Training Programmes 2015-2016, ARES grants 150 scholarships for participation into the mastersand 70 scholarships for participation into the training programmes. At the beginning of the programme, candidates must be less than 40 years old for courses, and less than 45 years old for training programmes.